Nowadays, the exterior aesthetic of your home or business can be just as important as the interior. Pulling up to a stunning building each and every day is a true privilege that many home and business owners take great pride in. This has led to an emergence of unique and stylish home and business designs. In this article we answer the question: Can I paint my roller shutter? Driveway surfaces can now be transformed into an ocean of colour and concentric shapes. Windows are often accentuated with shaded glass that’s both functional and modern. Industrial doors and roller shutters have become hugely desirable in bursts of colour, providing homes and businesses with warmth and individuality. Unfortunately, many manufacturers choose only to create these doors in bland, greyscale colours. This leaves the consumer with two options for achieving their desired look: either take on a burdensome painting job themselves, or order a bespoke roller shutter from a manufacturer that creates, supplies and fits roller shutters to the customer’s exact colour specification. Today, we’ll be looking at these two options. This article will explain how to paint a roller shutter, and will be exploring the time, cost and quality involved compared to ordering a bespoke shutter from a reputable manufacturer. Painting a roller shutter isn’t as easy as getting a paintbrush and some paint. You’ll need a variety of items to ensure that the paint is applied properly and the shutter isn’t damaged. The method begins by using a microfiber cloth to rub down the entirety of the shutter door. This will remove all the excess dust to ensure a smooth coating when applying the paint. Next, the entirety of the roller shutter door will need to be rubbed with sandpaper to give it a slightly rough texture. The rough texture acts as a cohesive surfacing, preventing drips and allowing the paint to stick better. The cloth must then be used again. Using sandpaper can leave little bits of excess material leftover, and these must be removed to ensure a smooth coating. The primer must then be applied. This is a preparatory coating that, again, increases adhesion for the paint to stick to the shutter. It is important that stage isn’t skipped, as primer also provides protection, and painting a roller shutter without primer runs an even higher risk of damaging the roller shutter. Next, the paint should be applied. This will dry very quickly, so best make sure no mistakes are made! Finally, use paint thinner to create a glossier, smoother finish to your coat of paint. The DIY method above is both laborious and tedious. Many people feel that painting a roller shutter themselves will help save on costs, but are unaware of the various steps and items needed to achieve a semi-professional result. Ultimately, the cost — in both time and money — is simply not worth it. Luckily, a better alternative is available. Here at Royal Industrial Doors, we create roller shutters in a vast array of colours. We listen to our clients’ exact needs, including personal touches such as colour, and create a bespoke roller shutter suited perfectly to their requirements. Not only does this allow you to receive a shutter perfectly adorning the colour of your choosing, but it also offers unrivalled levels of security, as the shutter will be optimised exactly to the specifications of your own window or door. The result is a high-quality, suitably coloured, perfectly smooth roller shutter unique to your home or business. 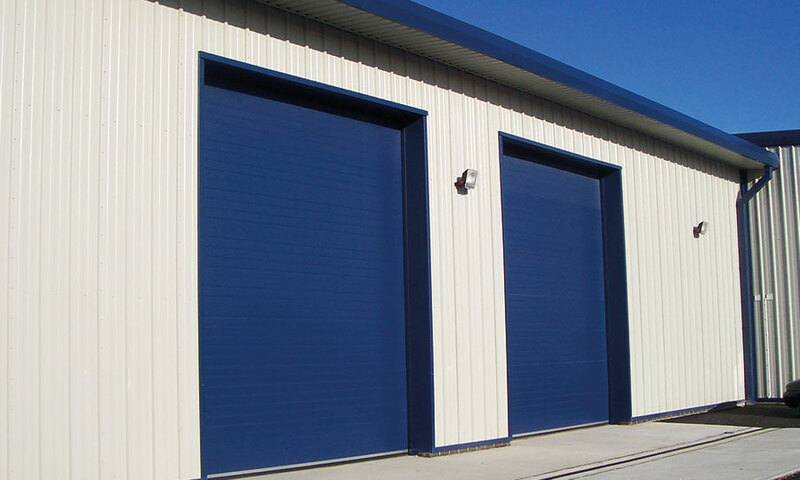 At Royal Industrial Doors, we cater for a wide range of needs with a variety of different door options. In addition to high speed doors, we also manufacture and supply security shutters, gates and traffic barriers, plastic strip curtains and much more. All our of products are manufactured by us, meaning our experts will be able to easily service and repair any issues that may occur. For more information about the wide range of service and products we offer, give our friendly team a call today.